After a dry and sunny summer extending well into October, air temperatures are cooler than normal and precipitation has increased allowing rivers to regain strength. Despite a dry summer, Puget Sound is fresher this year than the past 17 years. As of September, warmer temperatures remained in South Sound. In October, surface water in the Straits however began to cool and the influence of rivers can be seen in our ferry data. Leaves drift on the water in South Sound and smaller blooms are confined to inlets as the productive season winds down. Meet our new intern and discover if Puget Sound really has sea spiders. Description After a dry and sunny summer extending well into October, air temperatures are cooler than normal and precipitation has increased allowing rivers to regain strength. Despite a dry summer, Puget Sound is fresher this year than the past 17 years. As of September, warmer temperatures remained in South Sound. In October, surface water in the Straits however began to cool and the influence of rivers can be seen in our ferry data. 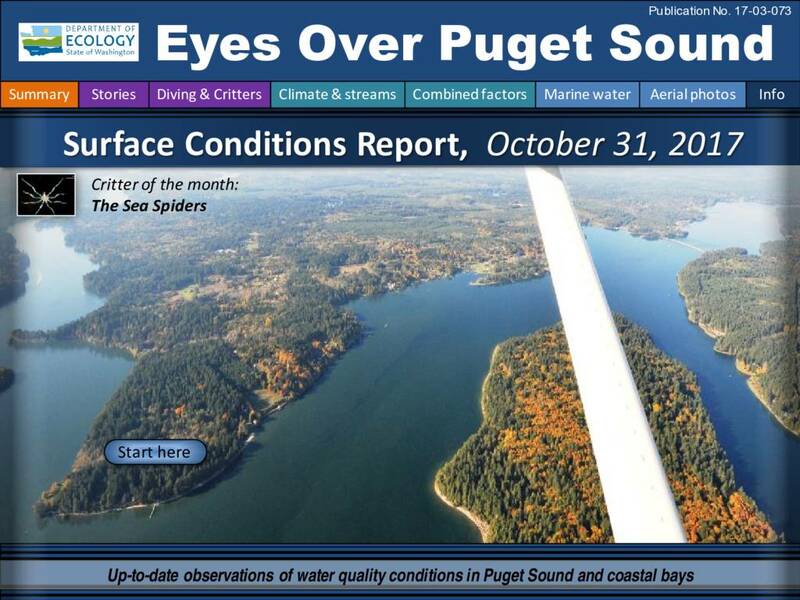 Leaves drift on the water in South Sound and smaller blooms are confined to inlets as the productive season winds down. Meet our new intern and discover if Puget Sound really has sea spiders.